Types of farming on agricultural holdings have a direct impact on various processes of soil degradation. These processes can be reduced by soil coverage with crops and harvest residues. Soil coverage primarily depends on the crop rotation. In Slovenia, the coverage in the period 1992–2008 was rather constant (between 62.7 and 73.1%). However, a gradual upward trend in soil coverage has been noted. The storage capacity for organic fertilisers is dominated by a combined storage of solid dung and liquid cattle manure, and most farms provide storage of the latter for more than six months. In 2004 and 2005, we noted an increased number of soil analyses allowing fertilisation based on soil reserves and fertilising plans. 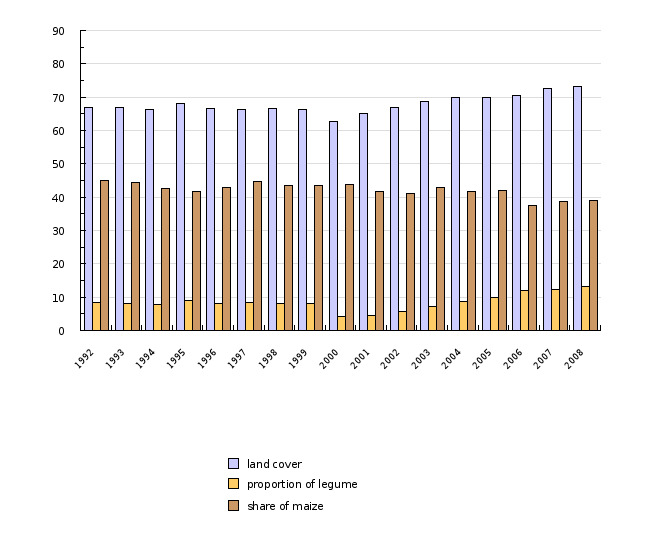 This indicator shows categories of agricultural land and soil coverage in the period 1992-2008, along with distribution of livestock farms in terms of storage capacity for organic manure, and the analysis of soil samples in Slovenia for the period 1995-2005. Types of farming on agricultural holdings are defined as decisions and practical measures that determine farm management. They include the technology of production like crop rotation, types of soil tillage and the related plant coverage of soil, as well as the types and capacity of storage for organic manure*. *Definition is taken from: H. P. Piorr, U. Eppler (University of Eberswalde) in the framework of the PAIS project (Proposal on Agri-Environmental-Indicators), financed by ESTAT (from 2000 to 2004). European Environment Agency, 2005; Central Cattle Breeding Database, Agricultural Institute of the Republic of Slovenia, 2005. Agricultural Institute of the Republic of Slovenia, 2006. · To provide adequate storage capacity and appropriate handling of livestock manure during its storage and use on fields. The types of farming on agricultural holdings have a direct impact on various processes of soil degradation, such as erosion, reduced organic substance in soil, compaction of soil and various types of pollution. These processes are reduced by covering of soil with crops and harvest residues and depend primarily on the structure of the crops in rotation. Among the categories of agricultural land in Slovenia, permanent grassland prevails, while the share of fields and kitchen gardens is the lowest. Nevertheless, the basic feature of Slovenian agriculture is that it is primarily focused on the production fodder. Maize heavily dominates among forage crops, as its production is the most economical. Narrow crop rotation results in relatively low coverage of land, a very large share of maize and few legumes in crop rotation. All these factors speed up soil degradation processes. The increasing proportion of land coverage and the increasing percentage of legumes in seed composition after 2000 is mainly a consequence of the introduction of certain measures within the Slovenian Agri-Environmental Programme and the Agricultural and Environmental Programme. Narrow crop rotation is a reflection of specialised agricultural production; therefore no significant changes can be expected within a short period of time. 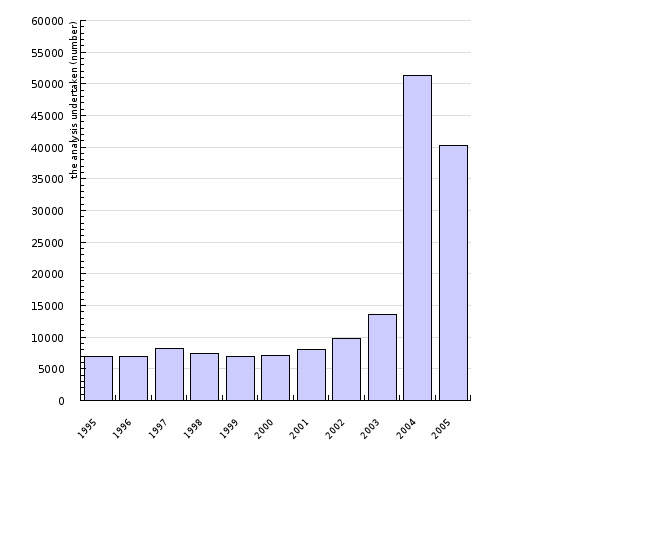 From this perspective, the period 1992–2008 can be seen as relatively short. Adequate storage capacity allows good management of livestock manure and reduces the risk of polluting natural resources. Slovenian regulations stipulate that there must be a 3.5 m2 manure facility with an associated pit of 2 m³ for each livestock unit (LU), or an 8 m³ pit or lagoon for slurry. Among dairy-oriented cattle farms, the dominating types of farms are those where livestock manure is stored as solid dung. According to a survey conducted in 2005, about 85% of farms have manure facilities with slurry pits, 2% have only manure facilities with no pits, and 13% have only slurry. The storage capacity of the facilities on farms that only have slurry is at the EU average. About 70% of Slovenian farms can store slurry for more than six months. The dominating type of storage area is a concrete pit outside the cowshed (55%), while there are sometimes storage facilities for slurry under the bars in the cowshed (39%). The rest are open overhead tanks and lagoons. In farms with combined storage facilities, the capacity is relatively large, sufficient for more than six months storage of livestock manure – the total capacity is above the EU average. The prevailing type of manure facilities are those with uncovered manure on an impermeable or concrete base (> 90%). As regards the type and capacity of manure facilities, the situation in Slovenia is comparable to the one in Finland and Sweden. Neither the EU, nor Slovenia has past data relating to slurry and manure storage, so the assessment of trends is not possible. Recently, the number of soil analyses has been increasing, which allows adaptation of fertilising to the needs of the plants. An exceptional increase in these analyses in 2004 and 2005 is due to the introduction of payments for the implementation of the Nitrate Directive, which, among other conditions, prescribes fertilisation based on a soil analysis fertilisation plan. Objectives summarized by: the Resolution on the national environmental protection programme 2005-2012 (ReNEAP, OG RS, No 2/06) and the Rural Development Programme of the Republic of Slovenia for the period 2007–2013. Source database or source: Statistical Information (2003-2009), Statistical Office of the Republic of Slovenia and the Central Cattle Breeding database, Agricultural Institute of Slovenia. Data administrator: Statistical Office of the Republic of Slovenia, Agricultural Institute of Slovenia. Methodology and frequency of data collection for the indicator: Calculations for land coverage and the share of maize and legumes in seed composition have been made according to the statistical data on the scope of cultivated crops and vegetables in fields and kitchen gardens. In order to calculate the land coverage, the same method was used as described in the final report for the environmental indicator IRENA 14. The conversion factor is based on the number of days from sowing to harvesting of individual crops and vegetables species, or groups of species. Such estimates are comparable with the estimates from other European countries, but are only available in part (for some countries in the year 2000). The Central Cattle Breeding database at the Agricultural Institute of Slovenia covers all information on the origin and yield of cows subject to milk production control (82,597 milking cows in 5,352 dairy farms). In 2005, the database was completed with the results of survey to analyse the status in herds and on farms. Neither the EU nor Slovenia dispose of information on the situation in the past, therefore the assessment of trends is not possible. Data on the number of soil samples were analysed according to records compiled by Janez Sušin from the Agricultural Institute of Slovenia. 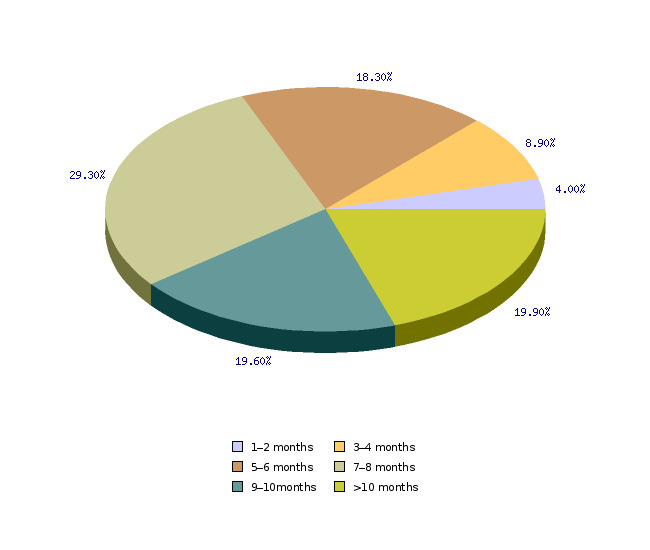 Data processing methodology: In drawing figures, numerical data were used and sometimes converted into shares for an easier display. - Advantages and disadvantages of the indicator: As there are no data on the situation in the past, the assessment of trends is not possible. - Relevance, accuracy, robustness, uncertainty: Reliability of the indicator (archival data): The indicator is reliable. - The Central Cattle Breeding database, Agricultural Institute of Slovenia, resumed on 18.11.2009.